The purpose for visiting Curaçao was to catch up with a delightful Dutch couple, Robert and Ellen, whom we had met in Hobart several years earlier. It was our first night of staying off the boat since 30 September 2016 (over 4 months) and we thoroughly enjoyed a beautiful home cooked meal and a bed that didn’t move all night!! To top it off, a shower that you could stand for as long as you liked! Such wonderful hospitality. Our passage to Cartagena in Colombia took a couple of days and sailing in this area requires vigilance – we were very conscious of not getting too close to the coast of Venezuela and thus opening up potential risks of piracy. The coast of Colombia is well known for its strong winds and several other OWR yachts had gusts of 40 knots or more and large seas – we were lucky and had a very easy time of it, to the point that we had to motor the last few hours. From the boat, Cartegena looks like the Gold Coast with tall modern hotel buildings and office blocks, but once into the marina we discovered secreted behind its modern facade, one of the most beautiful old walled cities that I have ever visited! Add to that the totally “cool” vibe of the Colombian people and we knew we were in for a treat!! Overwhelmingly, the Colombians are happy and helpful and welcoming, however sometimes they overlook the finer details! Example…we were requested to move our Marina location on the first morning in – no problem! Soon after Miss T was hard aground in the marina with the Marina Manager watching on and indicating that we should keep trying to get into a berth that was clearly too shallow. Luckily there was a helpful power boat alongside who were happy to assist! Some years it is hard to remember where you had your birthday, but I will not forget my 59th! We stayed in a small historical boutique hotel, had dinner with some of our Oyster friends who were in town on the night before the big day, and then came the day of pampering that had been prearranged by Sal and Will at the hotel spa…a 2 hour massage, a facial and then 2 hours at the hairdresser to try and tame my over blond, undernourished hair back into a more decent head of hair (if that is ever possible). As an aside, James and I are particularly bad with the Spanish language (no surprises there) and my concern was how I was going to describe colour and style! Amazingly the owner of the salon was a Colombian born hairdresser who had spent 20 years in a salon in Double Bay in Sydney and was very excited to have an Aussie in his shop! Charlie had told us about a local guy he had met called Henry, who was passionate about his city and a great guide. We organised to meet him near the Old Town to take us on a walking tour that same afternoon for an hour or so. Four hours later we bid him farewell after having been introduced to the history and culture of Cartegena. It was entertaining, interesting, informative and just what I would have imagined a Topdeck Trip Leaders’s walking tour should/would have been like! We were the ultimate tourists and enjoyed every moment, including a strong gin and tonic/ beer on top of the old city walls. The highlight for me was the story of their own Indian Pocohontis (Aracka Wacka) – my kind of girl!! 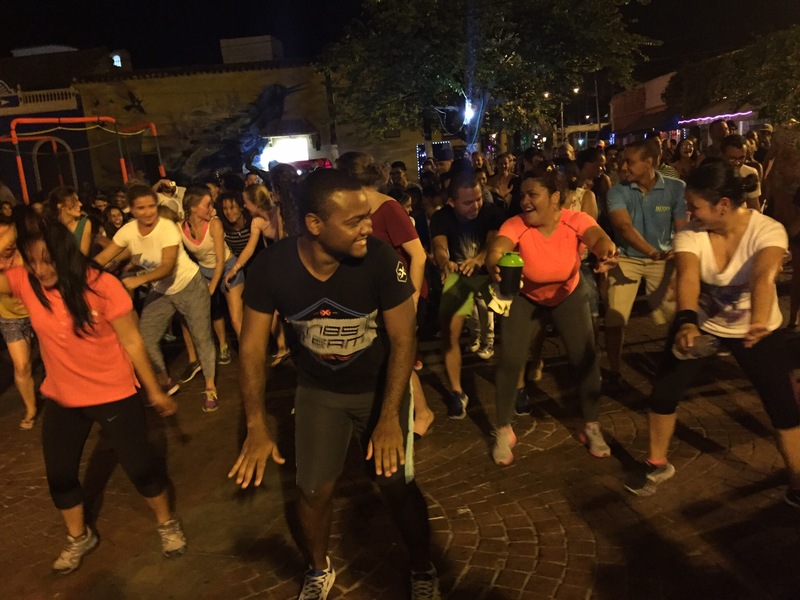 We downed some tapas on our way back to the boat and witnessed a fast and colourful Zumba session taking place in a local square – hundreds of back packers mingled with the locals to put on a great display! The work is never done and completing tasks on the boat is a constant….it is very hot and daytime temperatures sizzle in the mid 30’s on most days….it is clear we are getting closer to the equator! Standing on the dock of Hulamale waiting for our 3 boat Rally to depart for a long and potentially dangerous passage through the High Risk Area of the North Indian Ocean, past Somalia with its well documented piracy issues and up into the Red Sea was one of the most difficult and emotional moments I have experienced in our 2+ years at sea. 3 yachts, 6 armed guards, 1 woman, 3 skippers and 4 crew with enough provisions to feed all the hungry mouths sailed out of the Maldives late in March while I jetted back to the safety and comfort of Australia for my father’s 90th birthday. The emails I received from the Miss Tiggy give an insight into their journey! “Well after waiting all afternoon we finally pulled up our anchor at 6.15 pm with our security guys on board and associated firearms and ammunition body armour. The Polish guys seem like nice guys but very different atmosphere….As I type the guys are on the stern cleaning their guns. Not a lot to report we had a great days sailing yesterday in light winds with asymmetric. We are now heading further north so the wind angle prevents spinnaker use so are beam reaching with light and variable winds but doing 7.5kts. Still got a way to go until the security guards are getting serious. We are now sailing with our asymmetric up doing 8 knots in 9 knots of breeze so sailing fast in little wind…Fishing a non-event unfortunately 3 boats no fish! Otherwise all quiet the boat doing her stuff magnificently (fingers crossedit continues).We have come about 400nm 2,300 to go. Have just blown out the Red Devil (the name of our Asymmetric)….Split from top to bottom rubbish bin material now! No sign of anything yet. Few ships on AIS a long way ahead but we will start to run into shipping traffic tonight I expect. We are sailing in a arrowhead formation at present Calliope at the front (Their security team leader is team leader for 3 boats) and Lisanne and ourselves 1 nm back about 1/2 nm apart. A bit challenging sailing for a 1000nm in close formation but apparently gives them best line of fire in the unlikely event we get approached….But all good on board. We have entered the Gulf of Aden with Somalia on one side Yemen on the other; neither a place you would wish to holiday at the moment!! We are now in the IRTC Internationally Recognised Transit Corridor. This is not a separation scheme ala The English Chanel but a recommended corridor for shipping (ships leaving the Red Sea to follow each other in the southern lane and those heading for The Red Sea to follow each other in north bound lane). Each lane is 5nm wide and in between is a neutral corridor 2 nm wide which is where we are. We have 430nm to run on this course before we turn right and enter the Red Sea. (1200nm bottom of Red Sea to the top). The idea behind this is to keep all shipping as confined as possible and hence easiest for the various naval ships to monitor. So far we have seen no naval ships or suspicious craft. Biggest issue is no wind. We are into our 3rd day of motoring and used half our fuel. We are hoping for strengthening winds the further we proceed down The Gulf. Current forecast has strong southerly winds which will propel us into the Red Sea for about 200nm before the dreaded northerlies hit us for our long beat up-wind to Port Suez. For the last few nights we have been keeping the navigation lights off so we are much harder to spot, but of course now we are surrounded by shipping again we have put them back on. As you can imagine, staying in formation with two other yachts in the dark with no lights on is a bit of a challenge! It was made a lot easier with the guards remarkably good night vision cameras. We have now been sailing downwind for last 24 hours which has up-lifted everyone’s spirits as fuel worries have abated. (we all think we have enough to get thru to Suakin Sudan). We have had a few cruise ships pass us which is re-assuring. Yesterday we saw The Queen Mary on her way to Jordan and we have one of the Concordia ships passing us now. We are keeping well clear!!! We get “buzzed” daily by Japanese coalition aircraft who asks Calliope’s details and then wish us Bon Voyage. We are still making steady process and have about 60nm to run until we reach the end of the IRTC then we head north into the Red Sea passing abeam of Aden and I can’t stop thinking of the plight of those poor people trapped in that civil war or probably more correctly the war between Saudi Arabia and Iran. The passage at its narrowest point is only 10nm wide so I am presuming we will see Yemen on our right and Djibouti on our left. Apparently also a lot of small craft including fisherman and people smugglers are getting people out of Yemen. Well we have certainly had all sorts of sailing since my last up-date. We had a few days of very gentle sailing down the Gulf of Aden. Quite possibly lulled us into a false sense of security beacause it all changed when we got to the narrow strait at the bottom of the Red Sea Dar El Mandeb. We knew it was going to be windy BUT… My weather Grib showed gusting winds up to 40 knots. So we had an exhilarating but slightly scary ride for 8 hours. Maximum speed recorded by Miss T was 16.2 knots about 30 kilometres an hour. We had to manually steer because the autopilot can’t cope in those conditions which is very tiring because you must keep the boat dead downwind when every wave tries to screw you sideways so you are constantly correcting. If the boat was to go sideways and your crew are not quick enough easing the sails you could lose the mast because of the forces involved. Anyway Miss T did us proud and rightly lead the 3 bucking Oysters. They really are amazing boats though (Oysters) in these conditions we still managed to set the table and have lunch……30 knots plus and eating lunch at the cockpit table!…..the rather extreme conditions had 2 main benefits. First we logged some great miles but more importantly the sea conditions were so rough the skiffs we were expecting and any pirates could not venture out. We are now short hauled that is the wind is in front of us heading our way up The Red Sea. The prevailing wind in The Red Sea comes from the NW so the boat is heeled over making opening the fridge a mission. Oh well we only have 1000 more nautical miles of this! We have passed 15 degrees North which is the limit of The High Risk Area so a lot more joking on board and everyone feeling more relaxed. Miss Tiggy, Calliope and Lisanne are currently safely heading north having crossed the border between Sudan and Egypt. From a beach holiday destination perspective, the Maldives has it all. Fine white sandy beaches and layers of blue sea that are too hard to describe and that only photos can depict. But once again this is not a yachting destination, unless you have a sailing boat with a very shallow draft (catamarans are perfect) or an “in” with the resort islands. It is heaven when you find an anchorage that you are permitted to use that is not too close to a resort or a private island (of which there are hundreds) and even then if you ask if you can go ashore and spend money in their restaurant the answer is normally a negative. But….the atolls and islands of this Indian Ocean paradise are truly stunning! In diving/snorkelling terms, the “vis” (visibility) is as good as it gets. The water is so clear that you don’t need to get into the water – you can view the coral and marine life just sitting in the tender. An early morning snorkelling session to see Manta Rays was best approached by one person standing in the dinghy (in our case the Queen Mary as our tender has been nicknamed or the Porsche belonging to Calliope) and pointing out their location to the swimmers. It still amazes that they, the Mantas, are so unconcerned by our presence; when in a feeding pattern they are reminiscent of a Boeing 747 in flight. Alcohol is a big No No in this very Muslim country. The customs official that came onboard on arrival in Male was only interested in our dwindling amount of alcoholic beverages, for which he gave us a very clear warning they were not to be ashore and James’ shirts (we are very unclear as to why). No questions about pork or dogs or the multitude of other items on the list of items that are prohibited here. There is only one hotel on Male or connecting Hulhumale (population 150,000) that serves beer and wine and no restaurants! Dress is also a consideration. Many of the public beaches disallow bikinis (not such an issue for me) and mingling with the locals in markets and shops calls for women to have covered shoulders and knees which can be incredibly hot and sweaty for onshore provisioning. Air conditioning inside the malls is such a welcomed relief on days like that! I am in awe when I see the local women (and some girls) dressed from head to foot in black, even in the water. Male is very male! Of course, out in the islands where tourism reigns supreme, there is none of this…it is another world! Many of the resorts employ Europeans and the restaurants are fully stocked with fine fare. The airport is full of Asian and Euro aircraft delivering holiday makers to waiting Sea planes and ferries, ready to whisk them away to paradise. A big shop to prepare Miss Tiggy for her next long passage with just the boys on board; Kirsty, returning to the dreich weather in Scotland and me for a quick visit home to Tasmania to celebrate my father’s 90th birthday. To sustain them on their journey, as much fruit and vegetables as possible had to be hung in the saloon cabin! Sri Lanka is not a yachting destination – in fact, the “marina” in Galle is hard concrete, next to a cement works and not yacht friendly. But…Sri Lanka is beautiful and in every other sense it is priceless. The plan was to have some “land” time and so we hurriedly organised a short tour with a local driver, Lakpriya and our new friend Marlan a self-appointed “yacht agent” who can find the right people to help with any marine needs. A 5 day itinerary was put together, partly with Nicky and Charles and partly on our own, and we set off on our excursion. An elephant safari, 2 days high up in the cooler climes of the hill tea plantations, 2 nights in Colombo, a train ride back to Galle and 2 nights in a fabulous colonial style small hotel in the hills on our return. A short distance from Galle and on our way to Ella, we boarded our safari truck for a 3 hour elephant safari before heading up into the hills of southern Sri Lanka. The sense of relief at spending time at 1800 meters above sea level where the cool temperatures are perfect for growing tea and the flora more typical of Tasmania and England, gave us a break from the hot tropical weather we have been experiencing for the past months. It was great to be able to stretch the legs without drowning in sweat!! The last stretch of our inland journey to Ella was by rail – the perfect viewing platform for the vast growing areas of tea and vegetables. We managed to find a Sri Lankan version of Fawlty Towers! Having had many confusing dealings with one particular waiter, James actually asked him if we could call him Manuel! Just like his counterpart, he was very willing but not always able. At the other end of the scale our lovely hotel in the hills behind Galle is owned and operated by Hen (Henrietta), a delightful English lady who moves effortlessly around her hotel chatting to all the guests and making everyone feel at home. An afternoon bike ride, just nearby, took us around rice paddies and a tea plantation. Riding in convoy on dirt tracks, the noises and sounds varied from a low level jungle hum with birds singing and monkeys shrieking in the trees to the human keening at a funeral all over ridden by the bread delivery tuk tuk playing Fleur de Lis so loudly that it echoed around the valley. Aside from the touristic joys of our visit there still exists an undertone of the effects of the devastation brought on by the 2004 tsunami when 30,000 people died. Our new Sri Lankan friends, Marlan and Goring lost 10 family members between them and were left homeless as a result. Both have had to start again and move away from their beloved coastline to higher ground; Marlan has slowly been building up his unofficial Yacht Agency with the belief that money is only coloured paper and Goring purchased a tuk tuk which provides a great transport service for Marlan’s clients. The third member of the group, Pahan, also owns a tuk tuk, runs a local restaurant to which the yachting visitors would revert when hungry for a delicious Sri Lankan vegie curry. We cannot speak highly enough about our band of Sri Lankan brothers who not only assisted with marine tasks but invited us into their homes, introduced us to their families and told us their heart breaking stories of loss. They are a happy, helpful, giving group who wanted to make sure that we would love their country…and we did. Payment for Marlan’s services was not the “coloured paper” that he spoke so disparagingly of, but a bed for he and his wife so that they could lift their mattress off the floor and sleep aloft for the first time in 15 years. Calliope and Miss Tiggy were happy to accommodate. 3 days after clearing out from Galle we arrived in the idyllic atolls of the Maldives a short distance but a long way away from the hills and tea plantations of Sri Lanka. It may be only a 3 or 4 day sail from Myanmar to the Andaman Islands but they are worlds apart in many aspects….welcome to the nightmare bureaucracy that is India. Clearing in took most of 1 day and included 3 different governmental departments and 16 men wandering around lifting floorboards, poking in cupboards and taking photos of our family photos. Finally we were deemed to be safe and harmless and were allowed to stay…and they even wanted a photo with us! That was just the beginning of the procedures. Our yacht positions had to radioed to the local port control every day. Sadly there are only a few islands where visitors are permitted to go ashore – you can anchor but not step foot on the beach. Approved satellite phones can be used (luckily ours was), Calum’s drone was bonded for the entirety of our visit, paperwork and information was a constant and the internet/wifi availability an absolute nightmare. Clearing out also took nearly 12 hours! It is essential to appoint an agent to represent you on arrival. Ours was a charming local named Rathnam from Andaman Holidays who not only assisted with our arrival and departure requirements but fuel, shopping information, liaison services between us and the port control/coast guard and advice in regards to our movements amongst the islands. He also gave us the local rundown on what actually happened and why to John, the missionary gruesomely murdered on North Sentinel Island. The other incredibly helpful and friendly person, Umar, works on the dock and has done so since he was 9 years old. Now in his early 30’s, he has carved out an essential service for the yachts visiting Port Blair, looking after the dingy’s, assisting with fuelling and just being there with a friendly smile and a helping hand. The main town, Port Blair, is chaotic and colourful and like other cities in India has sacred cows roaming the streets, disrupting the traffic and grazing on large mounds of rubbish on the road side. The air is filled with the sounds of honking horns as tuk tuks weave in and out of motor bikes and cars. The remnants of British colonialism lie dormant on Ross Island, just across the bay from the town while small speedy boats jostle for position to pick up and drop off their paying passengers as quickly as they can. The cellular jail, used by the Brits to house the local freedom fighters, was an interesting diversion from all things marine. Alternatively the islands are a dream, the water aqua blue, the snorkelling and diving excellent. Our Oyster boats increased to 4 with the addition of Osterika (Oyster 55) owned by a Swiss guy, Patrick and his crew of 4 – Mauro (Italian), 2 lovely dive instructors Chantal (USA) and Elena (Swiss/Russian). In exchange for the use of our compressor to fill their tanks, the girls led us on some great dives and helped 2 crew, Kirsty and Kurt (Calliope), get their Padi Open Water diving certificates. Another bonus was 2 fabulous deep dives with a local man, Dickson, who with several friends, had discovered some of the best diving in the area, now named in their honour. Our favourite anchorage Beach #7 on Havelock Island is paradise. Beautiful fine white sand, a few choices of onshore dining, and a forest walking track through tall leafy trees to shade from the heat of the day. On our last morning James and I swam the 400 odd metres ashore and walked to the western end of the beach which we had not done before. There, as large as life, was a sign warning of “No swimming, salt water crocodiles inhabit this area”…and we still had to swim back to the boat. My birthday came and went with lots of lovely messages and a few well chosen gifts. I was especially thrilled by my gift from Sal and Will both of whom chose to donate to a charity for ocean health – something now very close to my heart. A administrative delay with clearing out of Thailand, which required some cloak and dagger activity in a small coffee shop in the Main Street of Kawthaung and clearing in to Myanmar lost us some time for beginning our cruising time in the Mergui Archipelago. As part of the governmental control of tourism, we had to take a local guide with us for our 10 day itinerary – a quiet, helpful, always smiling and delightful 25 year old Burmese man called Arnoe, joined the Miss Tiggy crew. A part of his role was to liaise with the local fishermen (including negotiating on our behalf for fresh fish and squid at the cost of a number of cans of coke or a small flask of local whiskey). He pointed out some great dive sites and snorkelling spots as well as directing us to some of the most glorious anchorage locations for our overnight stays. Our previous visit to Myanmar by plane did not have prepare us for the natural beauty of the south coast islands and the fact that our sails were more often than not the only ones on the horizon. We were possibly the only privately owned yacht in the area at the time although we shared several anchorages with local fishermen who did not approach us and we left them in peace. The cost involved in administrative work plus Arnoe is worth every dime! Mergui Archipelago is a cruising and diving Mecca! Flat seas with consistent winds, stunning rock wall dives displaying healthy and colourful coral and fish life (and no plastic) and swathes of sandy beaches with fine white sand offering up small rays, coral and tropical fish to view close up with mask and fins. A small number of resorts dot the islands but most were closed. The Boulder Bay Eco-tourism resort did allow us to hike around the island with their appointed guide and enjoy a cold beer while we briefly logged on to their wifi, but this was the only contact we had with anyone! In Phuket we shopped for some giveaways for the children of the islands. Pens, pencils, books, and boys and girls tee shirts. We visited several schools around the Archipelago but we most enjoyed this small classroom at a small fishing village which was attended by a small number of local kids before leaving for primary and high school in less remote and idyllic locations. Friendly and appreciative and so happy to greet us as were their parents! So much of what is amazing about our journey is visual and so we have set up an Instagram account called yachtmisstiggy and with the assistance of Calum and his drone called Drona we are able to document some of the beauty of our sailing adventure. With a “winners are grinners” post racing swagger, we hauled Miss Tiggy out for two weeks of TLC. The growth and barnacles that had joined us since her last bottom wash in NZ were numerous and attempting a spectacular take over bid. Our home was now high up above the hot concrete of a car park with no refrigeration or running water so we opted for an AirBnB condo with own pool, air con and all the mod cons. Heaven!! Time for home-making, some relaxation and behaving like normal people was great for the soul! The morning coffee addiction has been well catered for over the 6 weeks we have been in Phuket – the task to find great coffee in various locations has been very successful and helped in saving our Nespresso pods for passages. Wine is much more varied and available than had been reported but eye wateringly expensive. Finally a chain of Supermarkets called Villa Market became my favourite haunt to restock the boat and provision for the next few months ahead in places where western type food is not so common. Christmas and New Year came and went with the speed that only happens when you are having the best time. In a villa overlooking Surin Beach and the Andaman Sea with Sal, Will and Theo as our base, we swam, ate, played cards and enjoyed each other’s ‘ company which only happens on an annual basis at the moment. We found our family favourite London restaurant, Zuma, had a pop up on Phuket over Christmas and New Year so all their special delights were enjoyed at dinner on New Years Eve with music and fireworks to bring in 2019. But time, as always, flies at such speed that now in mid January we are on the brink of continuing our journey west. Calum returned to the freezing climes of Scotland for Christmas and New Year and has rejoined us, as has Kirsty, his lovely Scottish girlfriend, who will be additional crew for Miss Tiggy for the next few months. Our plan at this stage is to enjoy the unspoilt islands of Myanmar for diving and fishing, across the Andaman Sea to the Andaman Islands, an outpost of India (getting a visa for India to visit by yacht is an interesting task in itself ). Sir Lanka, the Maldives and Oman leading to the Red Sea and ultimately The Med…back to where it all started. Not sure what happened to the plan of putting Miss Tiggy on a yacht carrier but that seems to have been well and truly ditched! We have always been cruisers – race sailing has not been on the radar….until we were invited to join Eric and his Oyster 575, Lisanne, as crew in the Phuket Kings Cup regatta. Sounded like fun and was conveniently timed to coincide with our arrival in Thailand. Our crew was international – Eric and Lars hail from Sweden, Matt from the Netherlands, Calum from Scotland and Jimmy and I from Australia. Lisanne was entered in the Cruising Class – all 33 tons! I looked around the other yachts entered in our category and they all looked significantly smaller and lighter. At this stage I was unaware of the intricacies of sailing around the buoys, wind speed and ratings. 7 days of racing ahead, including a practice race – the unknown. Down came the Bimini and spray hood (the covers over the cockpit), which meant total exposure to the weather including sun. Off came the anchor which was transferred to dinghy. All unnecessary equipment, which would increase the weight of Lisanne, had already been left on Miss Tiggy. Each morning we were up at 6.15am, breakfast at 7, cutting sandwiches, repairing wounds (blisters and the likes), covering ourselves in sunscreen and moving out of the bay to join the other participants in the Andaman Sea. At 9 am, the Committee boat would instruct us on which course we would be sailing. There were 5 classes starting at different times so some 50 boats would mill around the line all trying to get the best position. Eric has raced boats for many years and his experience showed through. There was no time to be sensitive as our Viking leader roared orders. Everything was done at pace. We worked well as a crew – some of us have been sailing these Oysters nearly every day for over 2 years, and the fact that Lisanne is the same design and a similar spec to Miss Tiggy gave us an advantage. The one blip in the week was a late protest against us on the last day of racing – in the final hour before the presentations, Eric had to attend a jury meeting to face off a potential loss of position or disqualification but no penalty was applied and our number one position was safe. It was a great week! Line honours in every race and overall number one position after handicapping meant an invitation to the official awards ceremony to receive the Cup replica. This was a big deal – the town was cordoned off for the arrival of the King’s representative, who presented the prizes. There was much bowing and curtsying and military men wearing gold bars. Of course there were the mandatory parties, dinners and drinks and copious conversations about what if and what was. Thank you Eric for including us – it was a fantastic albeit an exhausting week.